Hesston coach Clint Rider tailors much of his coaching style from Ohio State coach Urban Meyer. Rider often incorporates Meyer’s E+R=O formula, where the E stands for Event, the R for response and the O for Outcome. On Twitter, Rider uses #TheChase, a hashtag the Buckeyes used in their unexpected run to the national championship two seasons ago. He frequently speaks of building champions in three areas, fathers, scholars and on the field. The equation has helped Hesston recover from a 1-3 start with opening road losses to Garden Plain (33-27), Halstead (26-24) and a Week 4 defeat against Nickerson (36-27). Since then, the Swathers have won nine straight, including back-to-back wins against higher-ranked teams in Phillipsburg (38-26) and Hoisington (35-19). Hesston is in its third state game in school history with a runner-up showing in ’89 and a championship in ’92. On Saturday, Hesston (10-3) plays two-time defending champion Rossville (12-1) in the Class 3A state title game. Start time is 1 p.m. from Hutchinson’s Gowans Stadium. It’s a rematch from the ’92 state game that Hesston won, 3-0, with a first quarter field goal. “I don’t know if we thought we would have been in this position a month and a half ago, but my goodness, just an incredible group of guys to be around,” Rider said. Rossville, tied with Claflin for fourth all-time in state playoff victories with 56, is 52-2 under fourth-year coach Derick Hammes. The Bulldawgs are 3-1 in games decided by a single score, including a 34-28 road win versus Sabetha in the second round and a 27-22 victory against Nemaha Central last week in a contest that came down to the final seconds. 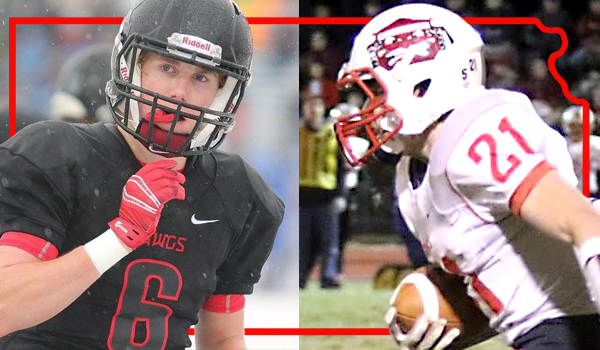 Rossville graduated quarterback Tucker Horak, who set multiple state records and won the Kpreps Get Busy Livin’ Player of the Year honor, but retooled behind senior quarterback Jacob Bradshaw and multiple players stepping up into some new key roles. Bradshaw has 263 rushes for 2,453 rushing yards and 29 scores. He has also completed 110 of 153 passes for 1,627 yards with 22 touchdowns against five interceptions. Senior Cole Schumacher has 52 catches for 1,024 yards and 18 scores. Hesston counters with an explosive pass offense with senior quarterback Zach Esau. He has completed 158 of 261 passes for 2,688 yards with 28 scores against 13 interceptions. Esau has rushed 211 times for 962 yards and 19 touchdowns. Sophomore Parker Roth has 177 carries for 1,135 rushing yards, also with 19 scores. Four receivers have at least 339 yards, led by 50 catches for 903 yards and 10 TDs from senior Zach Vogt. Sophomore Cameron Cox missed several games with a toe injury but has 41 catches for 741 yards and five TDs. Hesston averages 56 snaps a contest, six more than Rossville. However, a underrated key for both teams has been the development of the line play, especially offensive. Early on, Rider believed Hesston had a chance to win all three games they lost. In reference to Halstead, Rider said he “kind of felt like we gave that one way,” a contest Hesston led by 10 late. In the season opener, Hesston permitted Garden Plain to run for 417 yards and 7.9 yards per carry. That included a big game from Garden Plain standout Nate Pauly, who Rider likens to Bradshaw. In the postseason, Hesston had a second round 35-20 victory against Chaparral and limited the Roadrunners to 2.8 yards per carry. They held Chaparral standout Jacob Jenkins to 65 rushing yards and 3.3 yards a carry. In the quarterfinals, Hesston limited Phillipsburg to its second-lowest point total this year. Before the victory against top-ranked Hoisington, the Swathers watched Ohio State/Alabama from the playoffs two years ago. Alabama, led by its ground game, was the heavy favorite, but the Buckeyes pulled off the upset. Hesston permitted Hoisington to have the ball for more than 34 minutes but held the Cardinals to 4.7 yards per carry, including only 66 on 13 carries for speedy Cameron Davis. Entering the game, the Cardinals permitted 9.3 yards per carry, including 14.6 by Davis. Senior Jake Wingfield, a former linebacker, and one of Hesston’s top offensive/defensive linemen this season, missed the first two games because of meniscus surgery in early August. He wasn’t in game shape the first couple of weeks but has emerged as an anchor on both sides. On the offensive line, Wingfield and sophomore right tackle Sean Duerksen are the lone returners with any starting experience. Both started in a very limited capacity in 2015. Wingfield was in the backfield for most of last year. Sophomore Tyler Mason is at left tackle, junior Jesus Ramirez at left guard, and sophomore Alex Koehn at center. Senior Alex Hostetler is 150 pounds at linebacker but often played at the line of scrimmage against Hoisington 255-pound all-state lineman Landen Urban and slowed Cardinal running backs on several plays; Rider called him a “huge surprise.” Roth has stepped in at linebacker, too. “We’ve been able to contain some teams on the edge a little bit better,” Rider said. Vogt is at strong safety and Esau at free safety. Each are returning starters for a defense that ranked No. 1 in 3A last year. Esau’s was the team’s defensive player of the year last week. “He made so many tackles at four- and five-yard depth that maybe most safeties wouldn’t have made until 10 yards and just didn’t allow them to fall forward or keep churning,” Rider said. The offensive line has helped Rossville average nine yards per play; Hesston is at seven. Hammes credited offensive line coach Dan Schneider – “the best o-line coach you can find” – for building the group. Senior Dawson Hammes missed three early games with a thumb injury. The thumb has limited his pass-catching abilities. However, he still leads the team with 156 tackles and has 315 in the last two seasons. Junior Sheldon Hulbert has 117 tackles and took over after junior Reed Miller was hurt in early season. “I don’t know if we are sitting here today without a kid like him,” Hammes said. Last week, with the season on the line, senior Wyatt Dyche made a key interception in the end zone to defeat Nemaha Central, his team-high third pick this year. “What makes it gratifying is we not only did a good job of putting the pieces of the puzzle together, but we overcame adversity early in the football season,” Hammes said.